I am honoured to have been asked by General Gerry de Silva to write a Foreword to this book. I am also very pleased that he undertook the task of setting down the brave exploits of our soldiers. One of the biggest problems this country faces is its failure to remember. Successive governments keep reinventing the wheel, and often in the process make it less rounded than previously. A principal reason for this is the failure to maintain records, or to refer to them. A decade and a half ago, when I became Academic Coordinator of the degree programme that had been started at the Sri Lanka Military Academy, I suggested that the cadets should pay greater attention to recent military history. I was told by the officers in charge then that this would not be possible, since much of it was about failure. Since those responsible were still in positions of command, they would not want what went wrong to be analyzed. I found this immensely sad, and drew attention to the fact that Indian army personnel, following what can only be described as the debacle of the Indian Peace Keeping Force in Sri Lanka, had produced a number of books which highlighted the lessons to be learnt from that operation. But that is why the Indian army was seen as comparatively professional, whereas ours in those days was still floundering. All that changed in the decade that followed, and I believe the determination of some officers such as General Gamini Hettiarachchi to upgrade training, which also involved setting up the degree course, helped considerably. General Sarath Fonseka, who along with the Secretary of Defence contributed immensely to the victory, had initially been opposed to a degree course. He had this in common with many officers who thought we would create eggheads, whereas conversely my colleagues at the University thought we were lowering the value of the degree. But at my first meeting with him after I took over the Sri Lanka Peace Secretariat, in 2007, he assured me that he found the degree course officers well motivated. In fact they were in the thick of battle in the last few years of the conflict, and I am sadly aware of how many of them died. I was moved then to read, in this book, of how a couple of them laid down their lives, knowing the likely outcome of their brave effort to inspire or save their men. These were Captain Samaranayake of Intake 54, and Captain Punsiri of Intake 56, whose faces I still recall, not the most distinguished cadets academically, but always determined to learn. And there was yet another, even younger officer, whom I do not recall since he was in Intake 62, about the last I was able to teach properly, since 63 was not a degree course, an anomaly that was soon corrected. This young man died just over a year after he was commissioned at Puthukudiyiruppu during the fierce fighting of March 2009. I am pleased, and honoured, to contribute an introduction to this collection of poetry produced by So Pathmanathan. I got to know him well when he helped with the production of Mirrored Images, the collection of English and Sinhala and Tamil poetry that the National Book Trust of India published a couple of years back. He then participated actively in the various launches of the book, in Colombo and Jaffna and Matara in 2013. Then, in 2014, he toured a number of other universities too, together with English and Sinhala language poets, to introduce the book and discuss its contents from a shared pluraristic perspective. In the case of this volume too I use the work produced because, while the bulk of the book consists of translations which he has produced of the work of others, his own poetry is also included. The work as a whole showcases Tamil poetry of the last several years, and does this in English, which makes it accessible to more readers in the country. This is an eminently worthy task, because for far too long people in other parts of the country had no knowledge, let alone understanding, of what people whose first language was Tamil were going through. I do not say Tamil people, for this volume contains many poems by Muslims, which suggest both shared experiences and some instructive differences. The volume covers a wide range of experience, described in vivid language and moving imagery. Though obviously the skill with which the poems are presented is that of the translator, he has also managed to indicate some flavor of the individual styles of the various writers he has included. Obviously, given the dominant experiences of the last couple of decades, there is much emotion arising from violence and deprivation, but there are softer emotions too, and also some examples of whimsicality and romance. may appear in tomorrow’s papers! 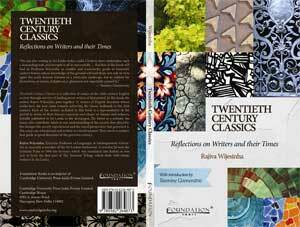 Twentieth Century Classics by Rajiva Wijesinha is a good introduction to the many authors and the varied genres of literature from the 20th century – dealing with the more famous names such as Arthur Conan Doyle and Agatha Christie to more obscure names like Angus Wilson and Somerset Maugham. As the introduction quotes, ‘a classic is a book that never finished saying what it has to say’ – thus it is important to ensure that they are always available to new audiences so the messages in them get passed on to new generations and aren’t lost in the sands of time. Sadly, many of the current generation misguidedly view them as old fashioned, stuffy and irrelevant in today’s technology controlled world, and thus many of these literary gems have been left to collect proverbial dust. Sometimes the only exposure to these classics people of today get is due to the compulsory reading lists in school. This book aims to change these misconceptions and encourage more people to take up reading these books for pleasure. Rajiva Wijesinha takes his readers on a tour of the leading 50 authors of the 20th century through his thoughts and musings on the works of individual authors. The sheer depth and breadth of the authors covered clearly shows he is a wellspring of literary knowledge and thus well qualified to introduce authors of a previous century to an audience in the 21st century. Writing a family history is a formidable undertaking. When Rajiva asked me to say a few words on the occasion of the launching of his book, I am amazed now at the light-hearted way in which I accepted his invitation. I was recalling, I think, the playful spirit in which I started writing a book about my own family in 1980, and I had quite forgotten the hard labour that occupied the five and a half years which passed before Relative Merits appeared in print in 1986. Rajiva, who is, as you know, an erudite, sensitive and extremely hardworking teacher of literature, tells me that Relative Merits established a ‘genre’. Such a statement, coming from a person trained to make careful literary judgments, seems to indicate that in many places in this land, there must be people beavering away at putting on record the stories of their own families. Well, good luck to them, I say. I had no intention of establishing any kind of genre. But, given the deep interest most Sri Lankans take in hunting out and talking about their own ancestries – not to mention hunting out and talking about the ancestries of others, especially of people they don’t like very much –it is more than likely that there are numerous people here this evening who are engaged in biographical writing of one kind and another. I would therefore like to give you some idea of what is involved in writing a family history. And also, perhaps, some insight into what writing this book must have involved for Rajiva.